The can of pumpkin and the box of pie crust dough mock me from their perch near the stove. They seem to sneer….”go ahead, we DARE you to try it…” Crap. It was with this taunt echoing in my head that I found myself sitting at my dining room table with the current issue of the Parade insert from my newspaper. 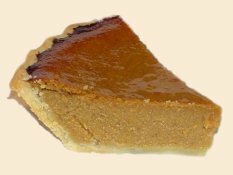 As I distractedly thumbed through the pages, one article caught my eyes: The Pie that Ate My Thanksgiving. Written by Jacquelyn Mitchard, the article expounds upon her lack of cooking talents and the pressures of creating The Thanksgiving Meal. WOW – someone else, just like me! Although I’ve been married for over 20 years, I have yet to cook a Thanksgiving meal. I have been fortunate enough to have my mom and mother-in-law around to do all the “heavy lifting” of the auspicious meal. To that end, I have been affectionately dubbed “The Roll Lady” because my sole job is to watch the crescent rolls so they don’t burn. I am an EXCELLENT roll lady, if I do say so myself! This year, however, I will be making a great majority of the meal at my house…including my mom’s pumpkin pie recipe. Unlike Mitchard who was trying to live up to her deceased, legendary-cook mother-in-law, my mother is in a different sort of heaven for the holiday…..on the beach in Mexico! Thus, I labor under the delusion that I will be able to create that tasty Thanksgiving treat all by myself! And so ~ suppressing my terror, I don my suit of armor (apron) and wield my sword (spatula), shouting, “en gard, sir pumpkin can….get ye into the pie!” Let’s hope I don’t burn the house down!